Why not share a Slice of Life with us! Don’t get me wrong, I loved walking on the beaches of San Juan, Puerto Rico and taking my new purple bathing suit for its maiden swim in the Marriot pool, and reading like a demon– finishing one novel and starting the next, but maybe Tuvia’s love of home is coloring my views. Now he’s a bit extreme. He loves to get away and loves to come home but he gets bored way too fast. We were away for 4 nights and 5 days. He was done with beach life on the 3rd day. NOT ME!!!! But we are back in the white cold with the promise of an upcoming storm to delay the start of a new PD project that’s scheduled for Thursday. What’s good about being home is I am up early with the energy I need to get back to work, with the drive to pick up my guitar that’s been gathering dust for the last few weeks. Hey, we have a March Marathon coming up, don’t we? 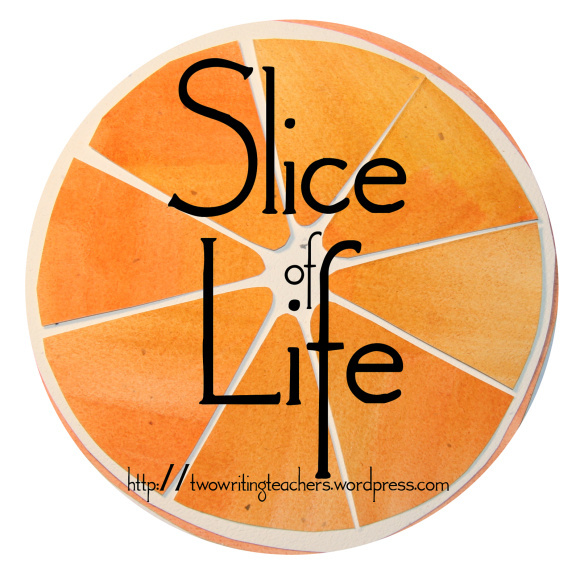 This entry was posted in Slice of Life Tuesdays, Two Writing Teachers and tagged Slice of life Tuesday, Two Writing Teachers. Bookmark the permalink. Sounds like your vacation was just what the doctor ordered and you are ready for your March writing marathon. I am. How about you, Bernadeete, ready? I like the Slice of Life. Thanks for the visit Sid! I think it is great how you cherish and find peace where ever you hang your hat. Lucky life. Welcome home, Bonnie! Your trip sounds divine, but there’s something wonderful about being in familiar surroundings that’s great too. It is always a pleasure to return home, I agree, although I like the adventure too. Happy for you both that the trip went beautifully & that you’re back home enjoying that, too, Bonnie! We have warm weather coming this week, so perhaps coming your way by the weekend? Glad you had a great time at the Colorado conference. Getting away for a few days is always great. Coming home is, at least for me, always better. What memories we have to cherish for years afterwards. Glad you had an enjoyable time. Agreed and the next trip is scheduled for March. Cancun, here we come! I hope that the upcoming storm doesn’t stop you from going to the swimming pool. March – waiting, wondering, worrying – writing. Together. Welcome back!!! Can’t wait to hear all about this vacation on Friday! oh my to the my, I love that porch. The lazy adventures are good inspiration for when we are feeling weighed down by the familiar. Great slice! Ahhh…. traveling is lovely but home is supreme. We’re about to get dumped on here in PA as well. I am looking forward to spring! Home is good, but a little more sunshine and a few degrees warmer (I would take even 10 degrees warmer!!!) would be even better! Yeah especially tomorrow. Another massive storm up here. UGH! I’m so envious of your “reading like a demon”. I so desperately need to make time to read. And yes, we have a challenge coming!!! It’s almost here!!!! I am in a very good reading zone right now. I’m not always here even with time. Loving my simple Kindle. That’s a help. No digital distractions.